UNITED NATIONS, December 21, 6 p.m. -- As dusk descended on the headquarters of the UN Friday night, budget negotiations continued in the basement, at higher and higher levels. The Permanent Representatives of Egypt and Norway sprawled on couches outside conference room 5, into which U.S. Ambassador Mark D. Wallace rushed at 4:45 p.m.. Ten minute later he left the building, then Controller Warren Sach left the room. "We're happy," he told Inner City Press, cryptic as ever. In the absence of transparency, amid the overflowing ashtrays of cafe tables outside Conference Room 5 we're left to compare the 65-page draft called "Rev. 2 of 20 December," on which is notated which delegation made which suggestion. Since the "Package of December 18" which Inner City Press previously uploaded, the target vacancy rates have gone up, from 6.3% to 6.5% for professional staff, 3.3% to 3.5% for general service staff. The enhanced cut, in Paragraph 94 of the December 20 Rev 2, was proposed by Japan. The draft budget resolution ranges from policy to nitty gritty. It includes criticism of the Secretariat's "piecemeal" budget, and calls for the next one to be submitted all at once. On other disputes, it "calls on the Secretary-General to urgently fill the position of Under Secretary General / Special Advisor for Africa," and "welcomes the Secretary General's assurance that the post of Under Secretary General for the Department of Field Support would go to a qualified candidate from a developing country," rather than the post's current occupant, American Jane Holl Lute. The draft gets down to the level of "noting with concern" three vacant posts in the UN's "web-services Arabic Unit." In the smoky basement, Egypt's Ambassador threw his arm around other diplomats; the UK's John Sawers put in an appearance. 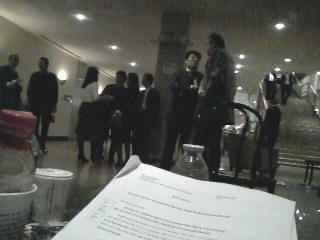 Up at the Security Council stakeout, Amb. Sawers told Inner City Press that the PTF should receive continued funding, and that the question of the UN's proposed new headquarters in Baghdad would be dealt with in the Spring. French Ambassador Jean-Maurice Ripert said more grandly that enough money must be provided to carry out the UN's mandate. Video here. The draft budget, at least today's Rev. 2, calls on the Secretary-General "to improve the scope of press releases." And so it goes at the UN -- watch this site.